A year or two ago, I had closely studied maps on how to do Gannett from the Green Lakes TH. Buzz Burrell and Peter Bakwin had pioneered the Wells Creek and Tourist Creek approaches and offered great insight and information. Turns out, I should have studied the route a bit closer just prior to this trip as not doing so would end up costing us several extra hours and miles. In a strange way though, having everything completely dialed can take some of the adventure out of it, so I was content with having a “rough idea” of the route in my head and no map…. I avoid flat running like the plague but the first 12 miles of this run, which is essentially flat, is absolutely amazing. It’s on the Highline Trail, which is also the Continental Divide Trail here, and offers unparalleled views. Watching the sun illuminate Squaretop Mountain and Granite Peak as we made the faint climb at mile 6 and 7 is awesome. I think Dakota’s mind was blown away by the beauty, which made me happy. We saw several resident moose enjoying the headwaters of the Green River, something I’ve come to count on from my previous two runs here with Ty Draney where we also saw moose. Eventually, we had arrived at what I was sure was Wells Creek and left the main trail, crossed the Green River and started bushwhacking up to a steep boulder field. The route is essentially all off-trail boulder hopping, river hiking, bushwhacking, and scrambling from this point on, which was fun. The canyon bottom forked, which confused me; something suddenly didn’t seem right. We chose the right option and kept going. 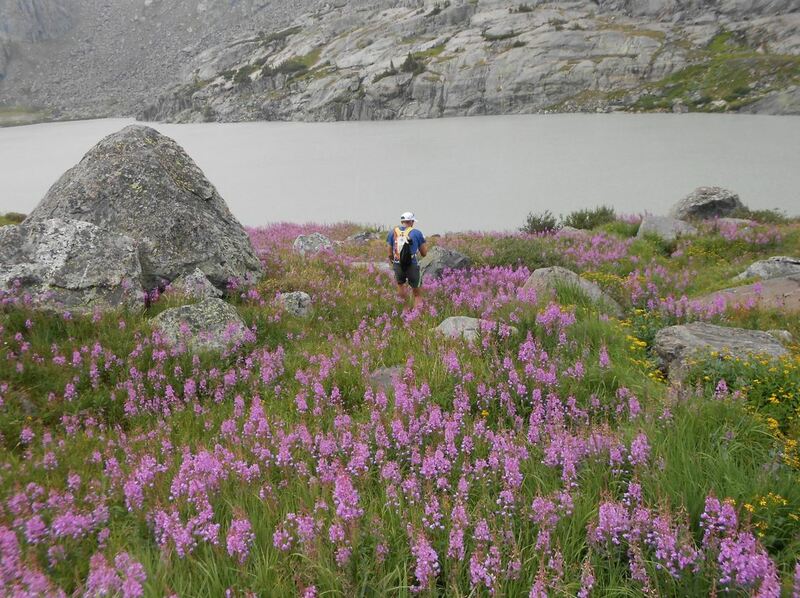 After what seemed like quite a while, we arrived at the base of a large peak next to a large and beautiful lake. Looking right, I didn’t see what I expected to see, I was a bit confused. I thought about it for a bit and then decided to stay left of the peak. We boulder hopped up past two lakes and then stopped above an absolutely incredible large lake (turns out it was Desolation Lake, at 11,478′). It was clear to me the mistake I had made and that we must be in Tourist Creek. I was a bit frustrated for my navigational error, but it was hard to complain given how amazing the setting was. Thankfully, Dakota didn’t seem to mind and was just happy to be there. At that moment the weather turned and started lightly raining and hailing. We weighed our options than then turned around backtracking our steps. Back at the spot where we had made a wrong turn, we talked for a moment about bailing due to the weather (we had minimal gear), but decided to press on and hope that the blue sky to the west would come our way. We dropped down to Scott Lake and were back on track. 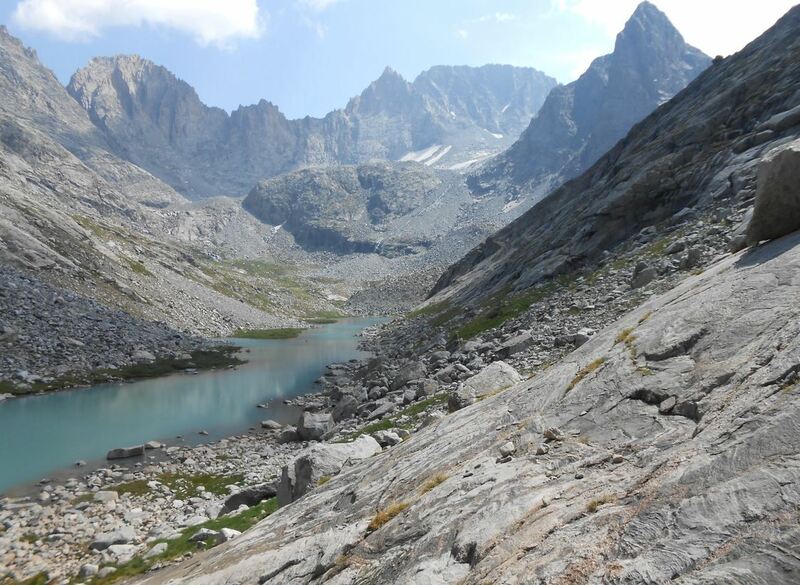 I’m always happy in the Wind Rivers, but this area was a step above other places I had been, jaw-droppingly beautiful. The weather cleared and we had a nice hike up Minor Glacier and up to the summit. After snapping a few photos and taking in the views we decided to head back. Looking south from the summit of Gannett. The flowers weren’t bad either! We were both really enjoying the day, taking a nice casual pace, which I was very happy with given that Nolans 14 was only 6 days away. At Scott Lake, we had a decision to make: a) continue on down Wells Creek or b) climb back up and over into Tourist Creek. We chose the Wells Creek option, which proved to be our second time-sink of the day. After a great deal of boulder hopping and tromping through water, the canyon narrowed and dropped steeply. This was super fun, mildly technical, and really loud from the raging river ripping through this steep granite chocked gully. Eventually we reached a section where the river became dangerously swift and steep and our options were few for how to get across the river and down. Sans rope, none of the options were appealing to both of us so we turned around, again, and re-traced our steps back to Scott Lake, climbed up and over into Tourist and made the seemingly never ending boulder hop an bushwack back to the Highline Trail. Somewhere on this section a pouch my camera/phone had been in opened and it fell out. My heart sank as I had taken so many great (and some very funny) photos and videos from the day. Back on the Highline trail we then jogged the 12 miles back to the car just as the sun set. Topo of our route. Note two unnecessary out-and-backs. Absolutely incredible route. Gannett Peak is a must do! Dakota is an incredible guy, a great partner, and someone I sincerely look forward to future adventures with. His enthusiasm and zeal for life is infectious. 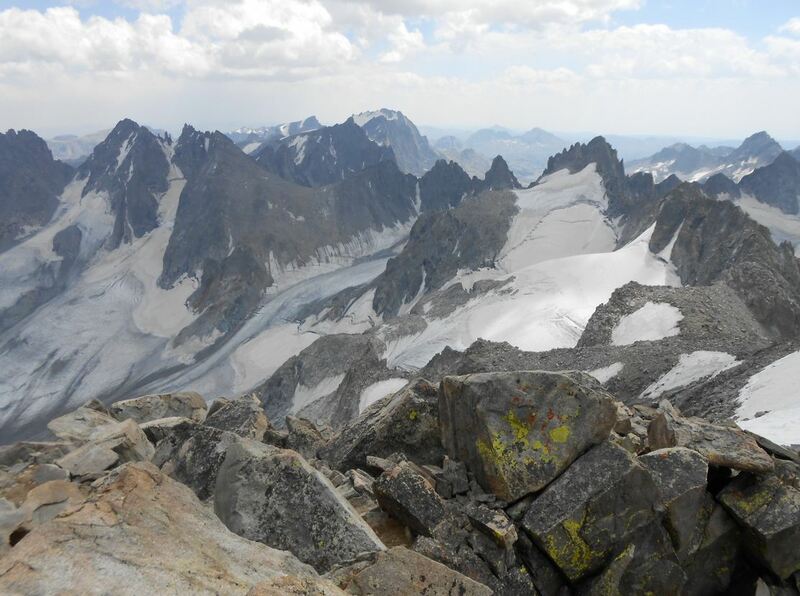 The Wind River Mountains are absolutely magical. Yet again, I’m reminded that I need to dedicate more of my life to exploring this range. Some beta photos (entire album here) : NOTE ; I lost my camera, so all pictures are from Dakota’s camera. Overview of the route : Yellow is the recommended route. Red is the route that we took. 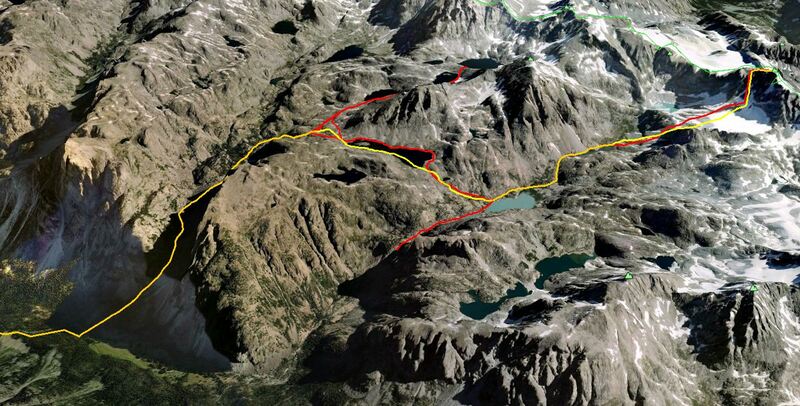 Zoomed in view of the recommended (yellow) route and our route in red. Great trip report and I love the maps. Is there any way to get access to the raw gpx file of the track you used to create the maps? I’m glad you enjoyed the maps. I’ve attached a .gpx file of the recommended route. Dude! Watching your Spot Track, I was thinking “Where the heck are these guys going?” Thought I explained it fairly well! Casualitis means Peter’s FKT lasts for another year! It’s not the only error I’ve done. That said, we still had a blast and got to see more terrain this way. Life is usually all about the FKT, :), but not this trip. 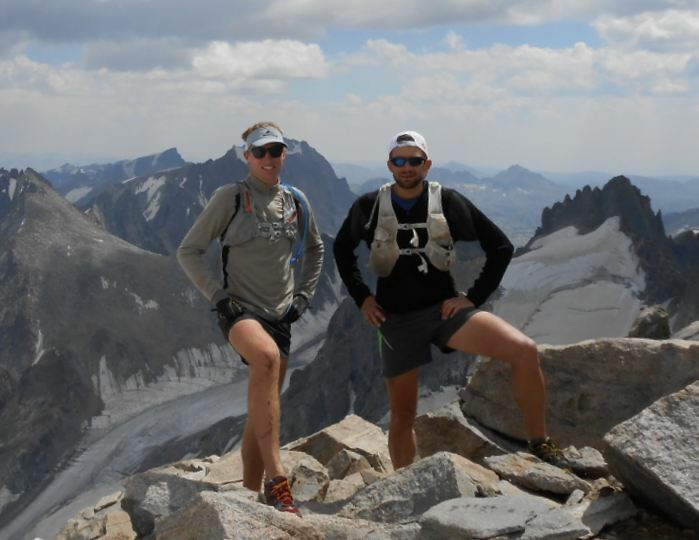 In fact, Dakota didn’t even know there was an FKT, he just wanted to see the Winds. 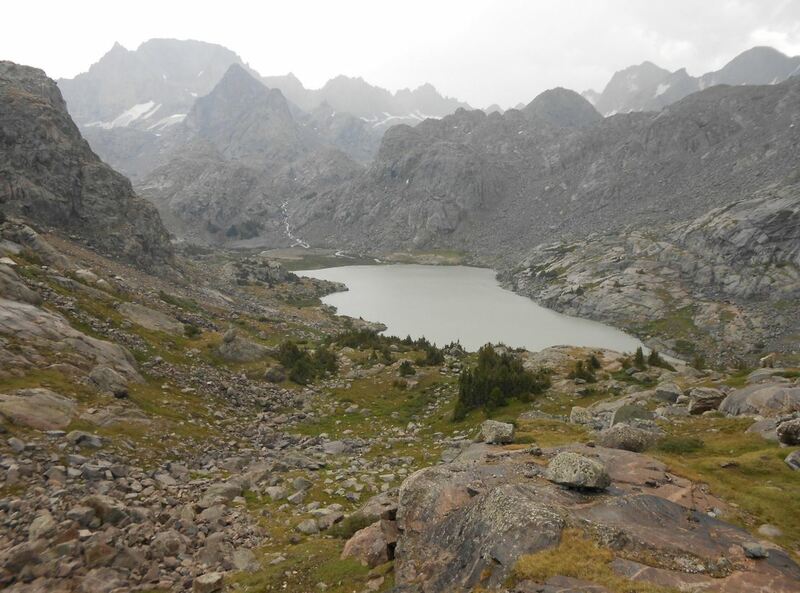 Went up last week from Elkhart Park, Titcomb Basin. I didn’t believe there could be a more scenic area than Titcomb but the route you took tops it. Love the pics……we spend alot of time in the Winds……what type of navigation/mapping system are you using?? Great report and pics! Aside from alaska the winds are the most beautiful place i have seen! Thanks for sharing!